$300 Instant Savings. Expires May 23, 2019. * All prices reflect savings. 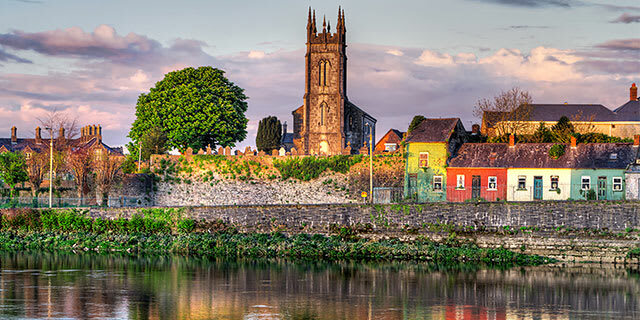 Just about everyone can find something to love about Ireland, from its stunning emerald green countryside, to its friendly helpful people, to its ancient castles and cozy pubs, and so much more. 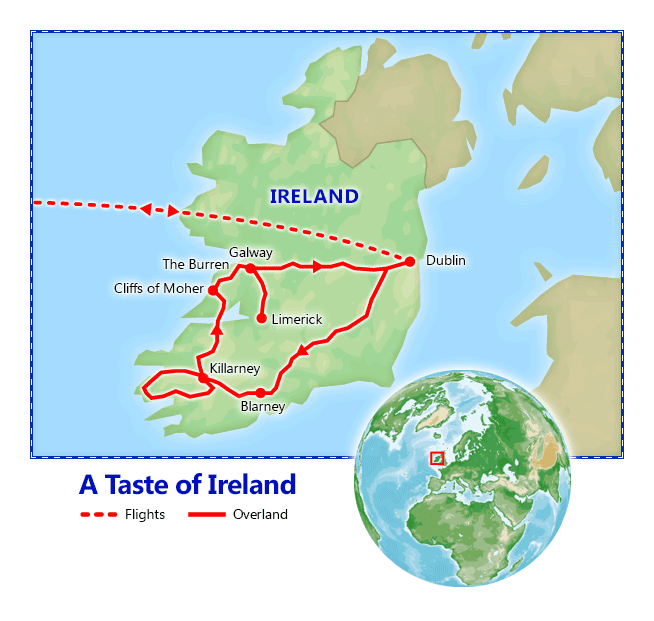 Join us on our 8-Day Taste of Ireland escorted tour and discover why it's one of the world's most visited destinations. 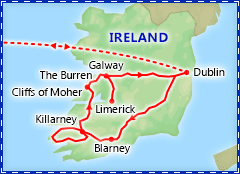 Your tour includes visits to Dublin, Kerry, Cliffs of Moher, Limerick and Galway. And you'll even get to kiss the Blarney Stone for good luck! But don't wait too long to reserve your spot as this deal will sell out fast. Instant Savings: Get $300 off if you book by May 23, 2019! Accommodations: 1 nightAshling Hotel, Hotel Riu Plaza The Gresham, O'Callaghan Mont Clare Hotel or similar, Dublin. Included meals: Dinner. 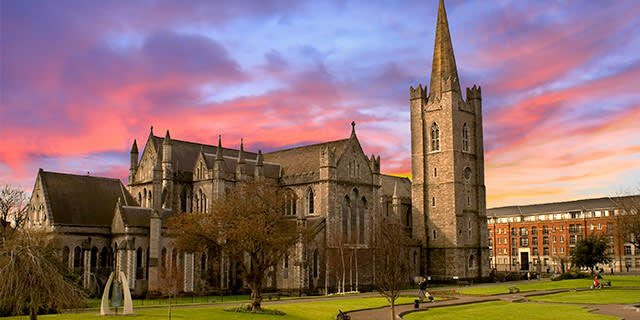 Full Day Itinerary: Upon arrival in Dublin, you will be met and transferred to your hotel. Most flights arrive early in the morning, but your hotel will allow you to safely store your luggage while you explore the city on your own. Today is yours at leisure to discover Dublin independently, or relax at your hotel. This evening, join your fellow travelers for dinner at your hotel. Accommodations: 2 nights Randles Hotel Killarney or similar, Kerry. Included meals: Breakfast. Full Day Itinerary: Today, you will board your touring coach, depart Ireland's capitol and travel to County Kerry. En route, stop in the town of Blarney for a visit to Blarney Castle. Dating from 1446, the castle is a tower house built on solid limestone. At the top of the Tower you will find the legendary Stone of Eloquence (Blarney Stone). Kiss it and you will never again be lost for words. Enjoy some time for shopping at Blarney Woolen Mills. The existence of the Woolen Mills during the famine shielded Blarney from the worst effects of the great famine, due to its employment of local workers. The success story at the mills continued until a disastrous fire in 1869. By August 1871, the mill was once again operational with a labor force of over 200 and in 1976 Chris Kelleher, himself a mill worker, bought the old mill property. Within a short period of time Chris and his family transformed the mill into what is perhaps the largest quality craft shop in Ireland. Continue through Ireland's Midlands to your hotel in the Kerry region. Full Day Itinerary: Today you can enjoy a superb tour of the Iveragh Peninsula, which will give you the opportunity to discover the Ring of Kerry, taking in the spectacular scenery: mountains, peat bogs, lakes and magnificent views of the Atlantic Ocean. Leaving Killarney, pass through Killorglin, famous for its Puck Fair and Glenbeigh, where the cliff road affords panoramic views of the Dingle Peninsula and Dingle Bay. Passing through the peat bogs, arrive at the sea town of Waterville. Continue to Sneem Village, famous because of its brightly colored houses. The road continues through the mountains to Moll's Gap and Ladies View with superb views of the famous Lakes of Killarney. Next, enjoy a ride through Killarney National Park by pony and trap, also known as a jaunting car, to discover areas of the park that you might not otherwise visit by foot. Relax aboard the jaunting car as your jarvey (driver) takes you through the magnificent scenery of Ireland's first National Park. This evening enjoy dinner on your own in one of the many restaurants or pubs in Killarney town. Accommodations: 1 night George Hotel or similar, Limerick. Included meals: Breakfast. Full Day Itinerary: Travel northwards to Tarbert and take a short boat ride across the mouth of the river Shannon, landing on Clare's shore at Killimer. Travel along the coast to the Cliffs of Moher. The most majestic cliffs in Ireland, the Cliffs of Moher rise 700 feet above the Atlantic Ocean and extend over four miles in length. On a clear day, you can admire the Aran Islands, the Connemara Mountains and the many sea birds that colonize this place to nest in spring. Visit the Atlantic Edge Interpretive Center built into the natural landscape. The center is a huge domed cave that contains various exhibits showcasing the mighty Cliffs of Moher. Later enjoy a tour of the Burren Region, a strange and unique region in Europe. "Burren" means "large stones", an apt description for this impressive scenery. Often described as lunar, the Burren is a high plateau of porous limestone situated in Northern Clare, between Ballyvaughan and Kilfenora. No trees grow here and no soil covers the stone, but the Burren is not deserted, as different types of flowers grow from the cracks all year round. The Burren Region is also historically rich, with many castles and monastic ruins. Continue to Limerick and check into your hotel. Enjoy the balance of the day at leisure. Optional Excursion: Medieval Banquet at Bunratty Castle, $70 Take advantage of an optional Medieval Banquet at Bunratty Castle on the banks of the Raite River including entertainment, a four-course meal and wine. Accommodations: 2 nights Academy Plaza Hotel (2018 only), Ashling Hotel, Hotel Riu Plaza The Gresham, O'Callaghan Mont Clare Hotel, or similar, Dublin. Included meals: Breakfast. Full Day Itinerary: After breakfast, travel from Limerick to Dublin. Along the way, visit Galway, a delightful city of narrow streets, old stone and wooden shopfronts, good restaurants and busy pubs. The city has attracted a bohemian crowd of musicians and artists, whom add much to its character. Enjoy some free time in the city for independent sightseeing or shopping. Continue to Dublin and check into your hotel. Full Day Itinerary: Today is yours at leisure to discover Dublin independently. Make your way to one of its most famous sights and continue exploring the city at your own pace with an included hop-on, hop-off bus tour voucher, visiting a number of Dublin's sightseeing highlights. If by the end of the day the touring has left you feeling parched, stop by a traditional Irish pub for a complimentary pint of Guinness, courtesy of Friendly Planet. The 4 star Ashling Hotel Dublin is an International Award Winning property located near Heuston Station, Dublin Zoo, Kilmainham Gaol, Collins Barracks and on the Luas red line. The hotel is also only a short stroll away from St. James’s Gate, making it the perfect choice for Guinness Storehouse Hotels.The property incorporates 225 beautifully appointed bedrooms, Chesterfields restaurant and the stylish Iveagh Bar. The combination of friendly, professional staff, spacious rooms and a warm, welcoming atmosphere make this your choice in Dublin. The George Boutique Luxury Hotel in downtown Limerick City is in a wonderful location just off of O'Connell Street. Minutes from St. Mary's Cathedral, St. John's Castle, shopping, and entertainment, the George is the perfect place to start exploring Limerick City from. This four star boutique hotel offers 125 stylish rooms with a cutting edge cosmopolitan design and accommodations to impress even the most discerning traveler. The George features a glass ceilinged restaurant, the candlelit bar is a great place for a quiet drink, and the rooftop terrace offers wonderful views of the city. The Randles Hotel Killarney offers 4 Star accommodation in Killarney and is ideally located, just five minutes' walk from Killarney Town Center. This unique Kerry Hotel has been welcoming guests since 1906. Famous for its Irish hospitality, guests will enjoy the comfort and elegance of an era long since past complimented by the most modern of facilities.Relax and unwind in the 76 room, 4-star Randles Court Hotel. Guests enjoy spacious rooms, fine dining in a choice of 2 restaurants, relaxing in the Drawing Room, Conservatory or Terraced Garden, and spending some downtime in our Leisure Club. A full service spa and health club offer an oasis retreat from a busy day of sightseeing. After the spa, guests can take a dip in the heated indoor pool or a long walk on the nearby beach. What should I know about Ireland? Check out our guide for travel tips, the best time to go, blog posts, videos, and more.